The originial BOBBIE BAIT was designed and built by well known Muskie fisherman Robert Vander Velden in the 1930's. For over 70 years the Bobbie Bait still proves to be a leading Muskie catching bait today. 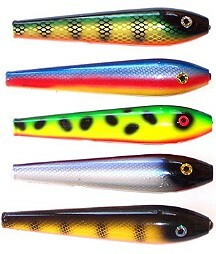 The originial Bobbie Bait comes in 4 sizes 6 1/2"- 8"- 9"- 9"weighted and the 12" trophy size. The 6 1/2" Bobbie Bait is mostly used for spring or when a down sized bait is required. The 6 1/2" is also an easy bait to throw and control for precise presentations anytime of the year. 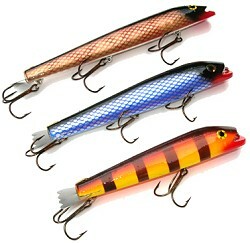 The 8" and 9" floating and weighted are the most used and common with Muskie fisherman. The Bobbie Giant 12" is a bait that has trophy written all over it. Excellent when you have spotted that hawg Muskie. Great for trolling with a large silhouette. The 6 1/2"- 8"- 9" floating 9" weighted and 12" now comes in all colors. This bait is made from select maple hardwoods and is a underwater glide bait. It is forward weighted to enhance its side to side movement for triggering even the most reluctant of fish This bait can be twitched or jerked. Quality componets, six fish attracting colors along with strong Mustad hooks make this bait 3 1/2 oz product a bait that's made to last. Use this 7" bait to cast submerged and emerging weeds as well as dropping down to rockpiles and sandbars.... HANG ON!